The Hyde Park Barracks once stood at the heart of a sprawling network of convict sites and systems. Its impact as an agent of colonial change and the transformation of Aboriginal Australia is still felt today. 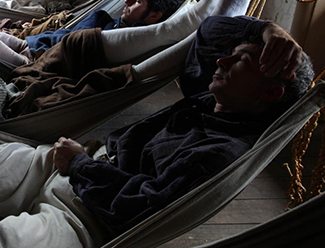 When it opened in 1819, its purpose was clear and simple - to sleep, feed and control upwards of 600 male convicts. It soon took on a more pivotal role. 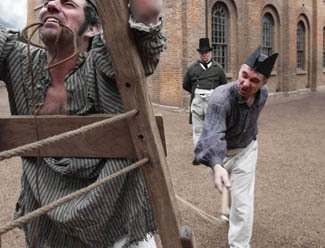 From 1830, officials working at the barracks administered what at that time was the world’s most elaborate and ambitious program of convict labour and punishment. A decade later as the tide of public opinion turned, convict transportation ended. The barracks, now obsolete, assumed another role - the grim reminder of a shameful past. By 1848, when Hyde Park Barracks ceased operating as dormitory wards and offices, an estimated 50,000 convicts had passed through its entrance gates. Yet the experience of being a convict, like the character of Convict Sydney, altered dramatically over time. As the frontier moved outwards from the original camp on Sydney Cove - sweeping violently across Aboriginal country and reordering the landscape with towns, roads, farms and European settlers - the place and predicament of convicts in colonial life also changed. This website tells the story of Convict Sydney in five parts. It explains how the colony ‘saw’ its convicts and wove them into its social and economic fabric. It also shows how the growing colony, with its dual emphasis on productivity and punishment, shaped and reshaped the convict experience. Part one starts in 1788 with Sydney established as a British convict colony on the clan lands of the Gadigal people. Initially struggling to survive, a farming settlement soon takes shape with convicts enjoying a surprising degree of freedom. Convicts not only build, farm and feed the colony, but they also run private businesses, raise families and foster lively free-spirited communities. With the Napoleonic Wars over in 1815 and Britain crowded with returned soldiers, poverty and crime, part two finds the colony swamped with incoming convicts. While there is the problem of housing and feeding the new arrivals, there is also an invigorated workforce. Despite their skills and efforts being valued, convicts face mounting rules and restrictions and new divisions between convicts and free colonists. From 1822, with the British government keen to cut costs and encourage pastoral expansion, part three sees the removal of convicts from town. Apart from a small number of skilled artisans and workshop gangs, only the most hardened and intractable convicts remain at Hyde Park Barracks. Sydney glimpses itself as a free and civil society, with an independent press, trial by jury and the dawning of free immigration. After 1826, the horrors and hardships of convict transportation are fully realised. Part four sees convicts chained on iron gangs or rotting in hellish outposts. The Hyde Park Barracks provides temporary sleeping quarters for convicts newly landed in Sydney or those returned to town for punishment or reassignment. While desperate convict runaways are a menace to the north, south and west, Sydney’s urban centre is abuzz and its waterfront is crowded. 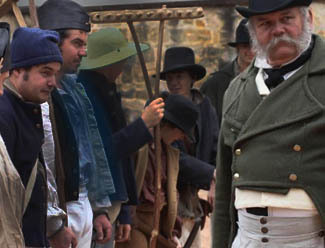 With the convict system under scrutiny by the British government in 1837 and the last of the transport ships docking in 1840, part five sees the decline of convict Sydney, leading to the closure of the Hyde Park Barracks for convicts in 1848. 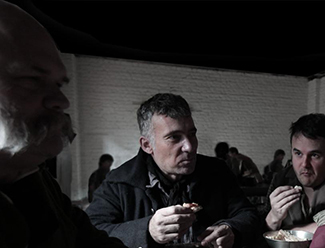 In its dismal final years, the Barracks holds those with sentences still to serve or prisoners returned from penal settlements. Outside the walls, the new ‘city’ of Sydney hums with commerce, industry and shipping, with suburban allotments taking shape and villages appearing. This website was made possible by a grant from the Australian Federal Government.